A year ago today, I was starting my 48 Miles in 48 Hours ultramarathon weekend. As frequent (or even occasional) readers of this blog know, I find any opportunity to mention my ultramarathon, even when it's completely irrelevant. I originally came up with the idea while running (which is where most of my ideas come from). I wanted to do an ultramarathon in a slightly non-traditional way. I wanted to break up 48 miles over two days with 8-mile segments. And I wanted a point-to-point course so that I could say that I actually went somewhere, as opposed to just running in loops. I recruited other runners from my law school and set up a donation site to the American Cancer Society. I mapped out the course and determined logistics, and then, one year ago today, I started my journey. As you'll see from my posts, things started out well and my first day ended well. The second day, well, that's when the wheels started to fall off the wagon. I started to get some pretty severe pain on the outside of my left foot, and my legs were incredibly heavy. I had to walk almost the last 13 miles, which made for an excruciatingly slow end. By the end, I was hobbling from traffic light to traffic light because I just wanted it to be over. Because we hadn't hit the full 48, we had to run around a condo development to make sure that I got the full 48 in. 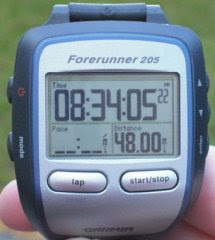 I finished and took a picture of my Garmin watch. That picture is framed and is the first thing I see in the morning when I wake up and the last thing when I go to bed. It's what helps me get out of bed on cold mornings. One year later, I couldn't be happier that I did the ultramarathon. At this point, I don't have any undying interest in doing another one, but I'm very happy I did the one I did. It reminded me that we can do anything we want if we put our minds to it, and work through some pain in the process. I think about the ultra often, and from time to time, I drive part of the course I ran. I can still remember where we stopped and how we felt at each stop. 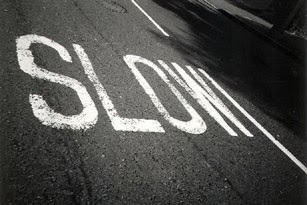 I remember how tough the hills were and how narrow the shoulders of the road were. Finishing the ultra remains one of the lasting memories for me, and I'm so grateful that my body and mind allowed me to do it. The Milwaukee Journal-Sentinel has an article about a marathon winner who was disqualified for using her iPod during two miles of the Lakefront Marathon. Jennifer Goebel originally finished in second place with a time of 3:02, but she was elevated to first place when the original winner, Cassie Peller, took a "rogue" water bottle from a friend rather than at a water stop. That water bottle cost Peller the win, and then the 2 miles of iPod use cost Goebel the win. 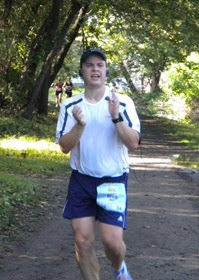 Someone posted a picture of Goebel wearing an iPod between miles 19 and 21, and then the proverbial fit hit the shan. may allow the use of portable listening devices not capable of receiving communication; however, those competing in Championships for awards, medals, or prize money may not use such devices. Well, Goebel was competing for an award, medal or prize money (she won $500), so she falls into the category of someone who isn't allowed to use an iPod in an event. She said that she only used it when she was bored because it helped to pump her up. I'm with you, Jennifer, but rules are rules. It definitely stinks that her time was kicked out of the official results. Don't give her a medal or prize money--fine. But removing her time because she used an iPod for two miles? Seems a bit harsh. That said, if I ever run a 3:02 marathon, I'm perfectly happy to give up all prize money and medals for using my iPod. You know, because it won't ever happen. 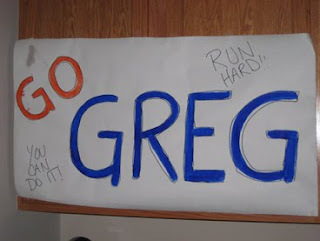 Besides, I'd still have a big Garmin watch picture on my wall to remind me of my time.